Every year CARE organises a wide range of amazing fundraising events around the UK. Getting involved as an event volunteer is a great way to support our work: you can help us to run an amazing event and at the same time give our supporters a fantastic experience. Doing this encourages some great fundraising along the way for CARE’s essential life-saving work. From marshalling to cheering, collecting donations to putting up signs and banners, we always need extra pairs of hands to ensure our events go smoothly – there’s always something to do! Come and volunteer on our events and you’ll be showing how much you care about fighting poverty and defending dignity. By volunteering for this event you will get the chance to be involved in running a fully immersive 10km race. It is a physical and mental challenge designed by CARE International based on the experiences of our humanitarian workers in real emergency situations. If acting in our medical centre, as a beneficiary or even helping out on our registration stand appeals to you- this is the event for you. 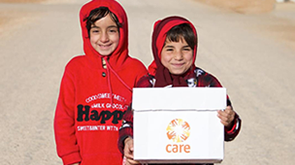 Do get in touch with the team on 020 7091 6111 or events@careinternational.org for more information. I just wanted to drop you all a note to say once again what an incredible event you put on yesterday. I know you've been working on it for some time, but to see something so complex executed so smoothly was inspirational. I’m still buzzing this evening. I know Race to Respond was intended to give participants a taster of the type of work CARE does, but I realised on the drive home this evening that as volunteers we perhaps got an even better taster. I can’t tell you how pleased we are that the event was a success – it didn't deserve anything less! A all-women trek like no other! Do you want to man a marshal point for walkers along the canals and rivers from Harlow to Hackney? Then this is the event for you! Cheer on and encourage over 100 women who will be walking in solidarity with those women and girls who have to walk for hours every day to collect water, preventing them from either attending school or working. Do get in touch with the team on 020 7091 6111 or events@careinternational.org for more information on how you can get involved with the day.